The Gap: How to Make Your Story a Page Turner! Lately I’ve been having a hard time finishing books. Not because the writing is bad, or the stories don’t have developed characters, or even interesting plots. The problem is the stories don’t grip me and I’m not compelled to pick them up again to see what happens next. With so many distractions in life – television, facebook, cooking classes – it’s easy to put a book down and stop reading. This is a reality we all must face. So, how do we keep our readers hooked? How do we make it impossible for them to put the story down? Of course there are a lot of possible answers to that question, but the one I want to talk about today is The Gap. The Gap is a concept coined by Robert McKee in his craft book STORY, wherein he argues that we read because we want to see characters presented with situations that “pry open a gap” in their lives. He describes the Gap as a moment in a character’s life when the world acts in a way that surprises them. It’s a revelation and/or situation in which the character’s landscape operates outside of what they knew was possible. For example, a tornado headed straight for your character’s house is a gap in their life. Normal life has been interrupted by mother nature and now your character must act. But a gap can also be as small as the “cool kids” deciding to talk to your character at school. It’s any event that tilts your character’s landscape in a new way and presents your character with new opportunities and obstacles. At least, on the surface that’s what a Gap is. But let’s talk about how to maximize the Gap and make your stories un-put-downable! Creating a Gap for your characters isn’t as simple as throwing obstacles in the character’s way and hoping for drama. 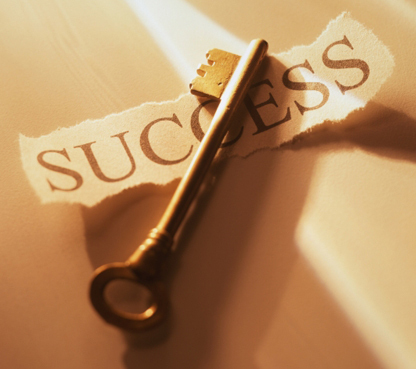 A compelling Gap will present your character with a situation that demands they make a difficult choice. This choice should be one that isn’t easy to run away from. I should “trap” your character and not allow them to return to their normal way of life. This is the space in which characters grow. It’s the space in which plot becomes so intoxicating your reader cannot put the book down. Why? Because we want to see what choice the character will make. And, we want to see the consequences of their actions. Okay, let’s look at an example to help illustrate this idea. One of my favorite examples of a compelling Gap is in the reaping scene in The Hunger Games. As writers we have a lot of choices to make in our novels. Hunger Games author, Susan Collins, could have chosen to have Katniss’s name pulled out of the reaping basket. This would have presented a Gap in Katniss’s life. She would be presented with the choice of accepting the challenge of the games or running away and putting her family in danger. But Susan Collins makes the Gap even more intense and unimaginable for Katniss. Instead of pulling Katniss’s name from the reaping basket, her sister Primm’s name is pulled. 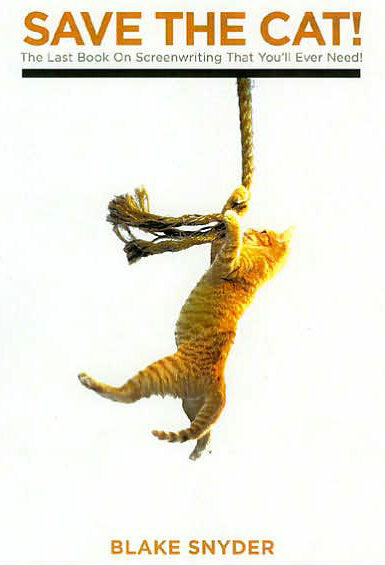 Now the world has really opened up and torn a Gap in Katniss’s life. The world has truly acted in a way she did not see coming. The Gap forces Katniss to choose between staying alive and watching her sister go off to die, or choosing to volunteer in her sister’s place and fight to the death. Neither decision is a good one. If you were forced to put the book down at that moment, before Katniss made her decision, don’t you think you would be itching to get back to reading? YES! Of course you want to see what choice she will make. This is the stuff of great drama! 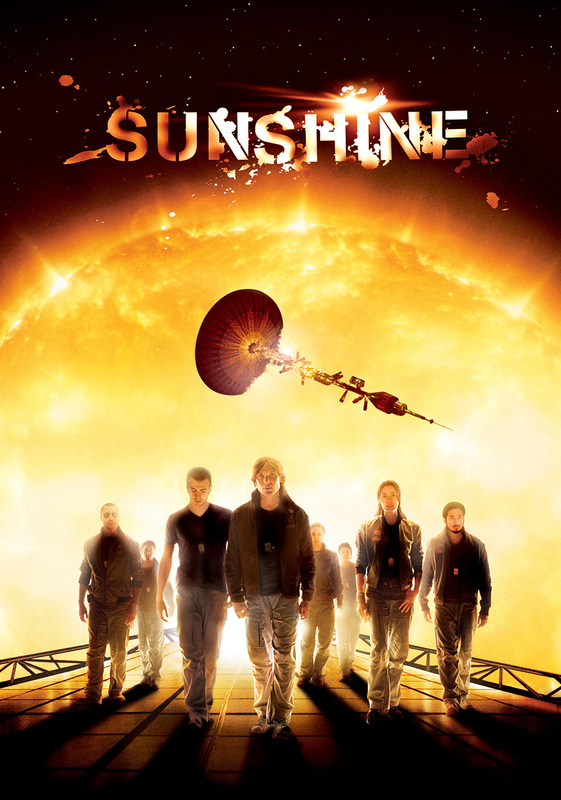 Another great example of Gaps is the movie Sunshine. This is a lesser known sci-fi film directed by Danny Boyle and written by Alex Garland. 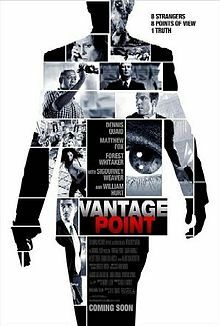 Every action, decision, and plot point in this movie has a consequence that forces the characters to face a new Gap. The film follows the crew of ICARUS 2, a spaceship flying toward Earth’s dying sun in hopes of “rebooting” it with a nuclear bomb. ICARUS 1 failed its mission in the past and ICARUS 2 is Earth’s last and final hope before the planet dies from lack of sunshine. The first gap in the film comes when ICARUS 2 receives a distress signal from ICARUS 1. The crew is now forced to make a choice. Do they alter their course to intercept ICARUS 1 and get a second “payload” bomb to help re-boot the sun, thus allowing them two chances for mission success, or do they stay on course and gamble that the one payload they have is enough? It’s not an easy decision. Both choices have consequences. As a reader we want to see what they will do! 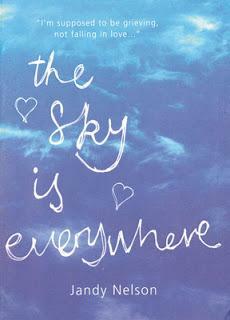 In Jandy Nelson’s young adult novel, The Sky Is Everywhere, teenage protagonist Lennie is dealing with the death of her older sister, Bailey. There’s a wonderful Gap when Lennie is hanging out with her sister’s boyfriend Toby. The two are chatting about Bailey, remembering her, and then they look at each other and — BAM! — Toby kisses Lennie. However, the gap comes in the moment when Lennie realizes she likes kissing her sister’s boyfriend! Suddenly the world has acted in a way outside of all that Lennie thought possible. And even more exciting, now she has to decide what she’s going to do about it. So, how can you apply the concept of The Gap to your work? Within the scope of your story, what Gaps have been presented in your protagonist’s life? How is your character challenged and incited to act by those Gaps? How has the Gap brought into question what your character believes, wants, and thinks is possible? What are the consequences of the choice your character makes when presented with a Gap? Does that choice move the story forward and take your character to the next Gap in the story? If not, does the Gap need to be changed so it challenges your character in stronger way? 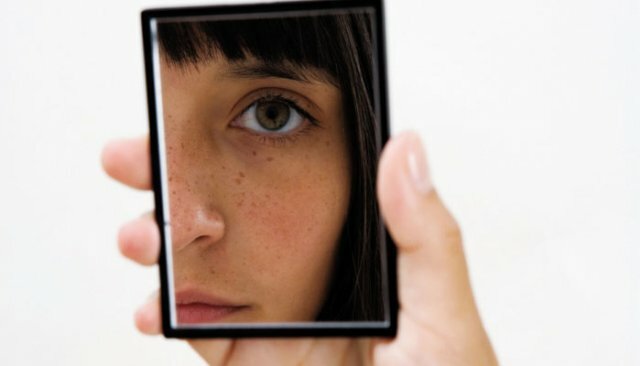 What does your character learn about herself as a result of the choices she makes when presented with those Gaps? It’s one thing to throw obstacles, problems, and action at your character, but that doesn’t make the story compelling on its own. We often hear the phrase “torture your characters,” but that’s not what captures your reader’s attention. 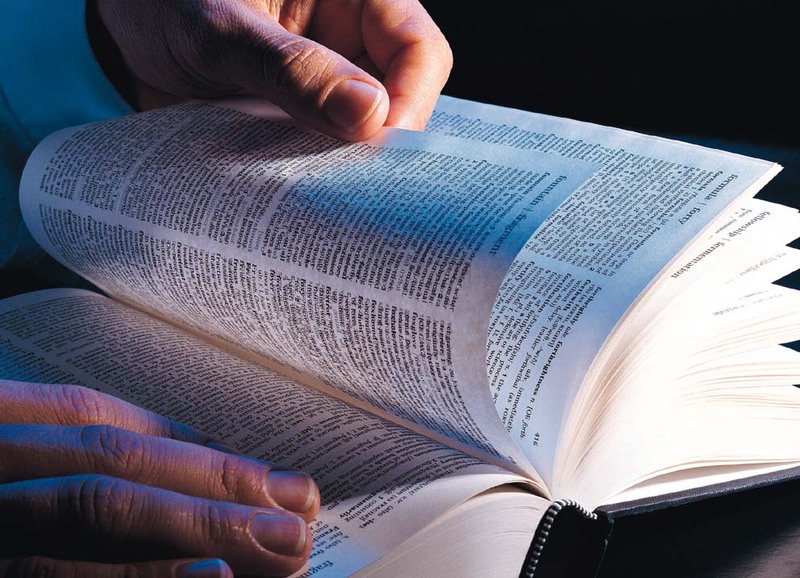 It’s the moral questions imbedded within the choices they must make that allows your reader to peek through the words on the page and see what makes us human. It’s those choices and the subsequent consequences that compel readers to picking the book up, again and again, to see what will happen next. Want to learn more about The Gap? Story by Robert McKee, specifically pages 147 to 149. McKee also talks about the Gap on pages: 154-157, 177-180, 208, 270-271, 311-312, 362. These page numbers are based on the 1997, hardcover, It Books edition. I’ve spent the last two months talking all about classical design, alternative structures and plots, and designing principles! Hopefully you’ve seen that there are innumerable design possibilities at your fingertips. But as I walked us through this series, I’m sure a few of you read my posts and thought to yourself: Doesn’t that story fit into multiple types of structure? For example, as I explained that The Godfather uses a fairy-tale structure, you might have been thinking: But Ingrid, it also uses the mountain structure! To which I’d say: You’re right! Which brings me to my final point in this series: design and structure are layered. You won’t necessarily pick on design concept and be done. In the film Memento, the designing principle uses a backwards structure to reflect short term memory. But it also has a goal-oriented plot and a mountain structure. Only the major structural beats are flipped. If the story was told forward, what would be considered the inciting incident becomes the climax when it’s told backwards. Additionally, because the story revisits events of the past, again and again, you could also consider this movie to have a spiral structure. Helen Frost’s novel Keesha’s House is also layered. It’s told with eight protagonists as a portrait of a community and each chapter uses a wheel structure to unify the characters through a theme. But the structure of the whole novel still uses a mountain escalation as each chapter introduces new obstacles. It’s also a goal-oriented plot: to find a safe place to live. Stories are layered. And you may find, like me, that the story you’re trying to tell doesn’t fit easily into a three act structure or the hero’s journey. Or maybe it does. And it’s okay if it does. Just make sure that’s a choice you’ve made because it’s right for your story. Only you know how to tell your story and only you know how to design it. Thanks for reading this series! In my last two posts I covered a variety of alternative plots that deviate from traditional arch plot. In this post I want to address what is known as a plot genre. So, why aren’t these alternative plots? Why didn’t I include them in my alternative plot list? This is the difference between what I call a plot type and a plot genre. The list above is a category: romance, mystery, superhero, buddy flick, etc. They all come with conventions and audience expectations. And yes, they sometime even come with what one might call “obligatory scenes” (i.e. a scene you would expect from that genre of story). In my book, however, these are all still variations of the hero’s journey/goal-oriented plot. They don’t push the envelope of plot in a new way. Instead they use the conventions of arch plot to tell this variation of the goal-oriented story. Instead of a quest, it’s the goal to “get the girl” or “seek revenge” or “solve the mystery.” The reason we often hear that there is only “one type of story” is because we often lump everything (including all these genre variations) under the umbrella of a goal-oriented story. Of course you can take any one of these genres and decide to use an alternative plot! Of course you can! And I’d love to see you do that. But let’s not get confused. A plot-type is defined by the type of action and it’s cause-and-effect relationships. 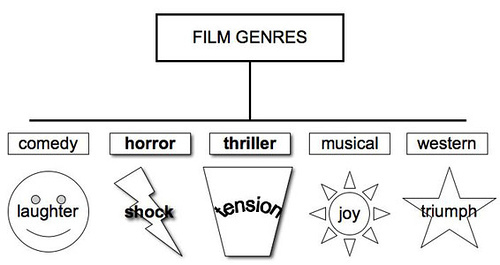 Whereas a plot-genre is defined by the category of the story-type and the expectations and conventions of that category. Thanks for coming back to learn more about alternative plots! Last week in Part 1, I covered mini-plot, daisy chain plot, cautionary tale plot, and ensemble plot. Today we’re going to continue to push the boundaries of arch plot and the hero’s journey by taking a look at along-for-the-ride plot, symbolic juxtaposition plot, repeated event plot, and repeated action plot. Again, I’ve termed an alternative plot as one that doesn’t have a hero (as defined by the hero’s journey), one that lacks a specific goal, or one that does not use traditional cause-and-effect as its connective tissue. In the Along for the Ride plot there isn’t an active protagonist. Instead a secondary character drives the action and the protagonist is along for the ride. Often there’s still a change in the protagonist, showing that we don’t always have to be active goal-seekers for an event or person to incite personal growth. 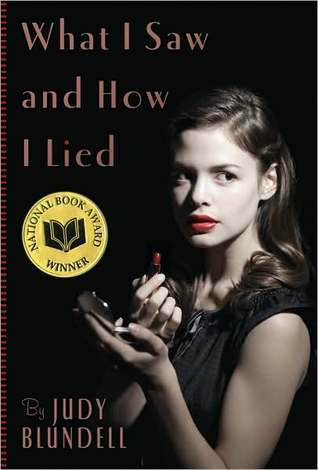 Book Examples: Looking for Alaska (Green), What I Saw and How I Lied (Blundell), Rebecca (Maurier). In the symbolic juxtaposition plot the reader should be prepared for a more intellectual experience. 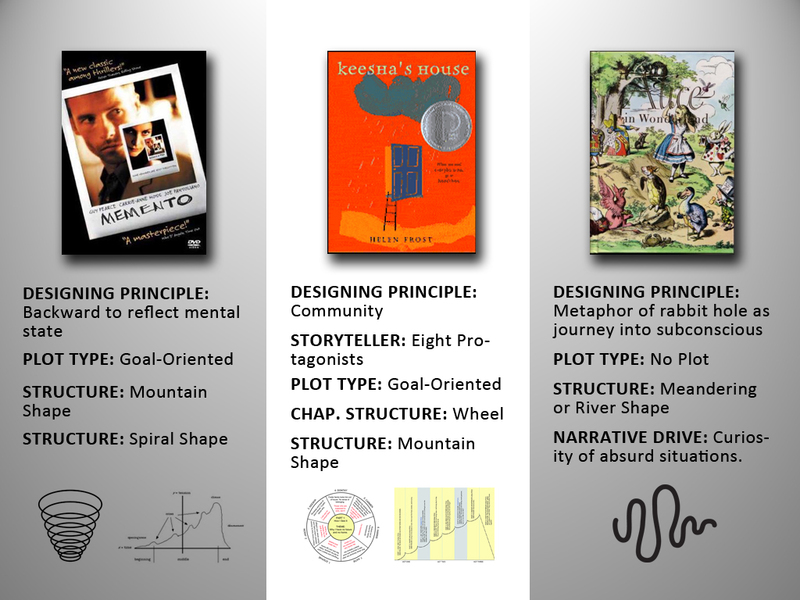 Instead of traditional cause-and-effect, this plot uses themes, ideas, images, and concepts to connect scenes and sequences with meaning. It’s a more argumentative plot development where X doesn’t cause Y, but X is in a symbolic relationship to Y. 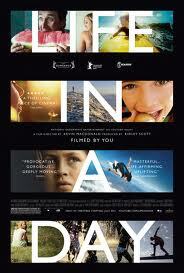 Film Examples: Life in a Day, The Tree of Life, The Thin Red Line, Chunking Express, Waking Life. Book Examples: Einstein’s Dreams (Lightman), Criss Cross (Perkins). In classical narrative, the same event is never shown twice. In this plot type, however, one event repeats several times throughout the story, but each re-telling usually offers a new perspective. Multiple characters are used to show that there is more than one version of the truth. Film Examples: Vantage Point, Hero, He Loves Me…He Loves Me Not. In this plot, a single character repeats an action over and over with the underlying design mantra of “we are going to keep doing this until we get it right.” This plot could be categorized as a goal-oriented plot, as the protagonist may have a goal, and the obstacles are the repetition of a single action with different outcomes. However, I’ve added it here, because it is a deviation from linear goal-oriented plot. Film Examples: Run Lola Run, Groundhog Day, The Butterfly Effect, 50 First Dates. 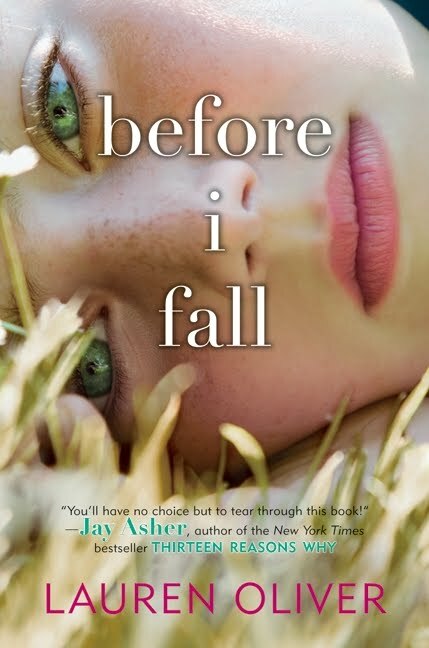 Book Examples: Before I Fall (Oliver). Are these the only plot types that exist? Absolutely not! This is simply the list I’ve created thus far in my search for alternative plots. If you know of more alternative plots, I’d love to hear about them! Berg, Charles Ramirez. “A Taxonomy of Alternative Plots in Recent Films: Classifying the ‘Tarantino Effect.’” Film Criticism, Vol. 31, Issue 1-2, 5-57, 22 Sept 2006. Ebsco Host. Web. 6 May 2011. Pages 44 -66 in: McKee, Robert. Story: Substance, Structure, Style and the Principles of Screenwriting. New York: IT Books, 1997. Pages 165 – 194 in: Gardner, John. The Art of Fiction. New York: Vintage Books, 1983. Coming up next: Alternative structures! Up to this point in my Organic Architecture Series, I’ve been discussing the goal-oriented plot (arch plot) and the limitations of this plot-type. Arch plot functions in such a way that the connective tissue is a desire that moves the plot through its progression. But are there plots where the cause-and-effect tissue isn’t defined by goals? Or plots that don’t have heroes? Or plots where the main character isn’t active? This list is by no means complete and I’m constantly on the lookout for more! I’ve defined an alternative plot as one that doesn’t have a hero (as termed by the hero’s journey), one that lacks a specific goal, or one that does not use traditional cause-and-effect as its connective tissue. Let’s look at how a few of these plots are different than the hero’s journey arch plot. Mini plot is a minimalist approach to arch plot in which the writer reduces the elements of classical design. Often these stories are internal and appear to be plot-less, and/or have passive protagonists. However, the cause-and-effect links are often derived from points of emotional growth rather than high-stakes action. Some might argue that this is a “watered down” version of arch plot, because you can still see the same patterns of arch plot arising in mini-plot, but on a smaller more emotional level. 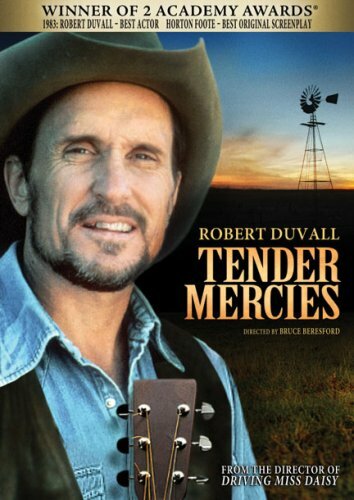 Film Examples: Tender Mercies, Five Easy Pieces, Wild Strawberries. In the daisy chain plot there is no central protagonist with a goal. Instead multiple characters or situations are introduced through the cause-and-effect connective tissue of a physical object that is passed from one character to the next. 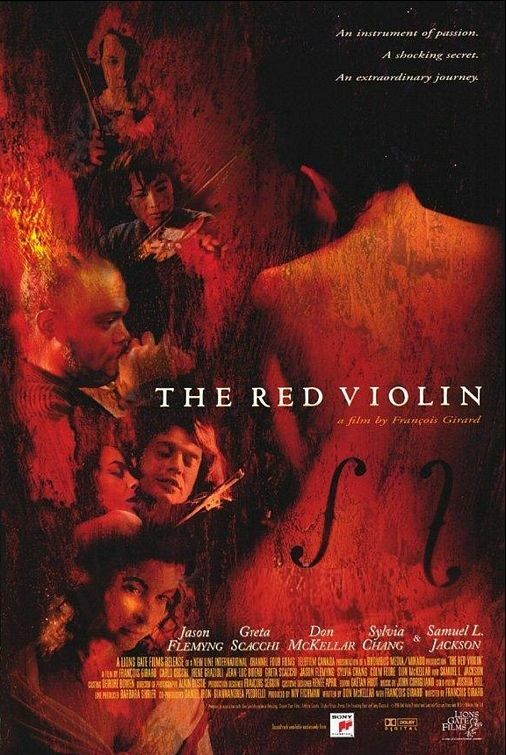 Film Examples: The Red Violin, Twenty Bucks. Book Examples: Lethal Passage (Larson). Modified Daisy Chain Plots with a Protagonist: The Strange Case of Origami Yoda (Angleberger), Thirteen Reasons Why (Asher). In the cautionary tale plot there isn’t a hero and it is often the antithesis of comforting growth. In both Chris Lynch’s Inexcusable and Todd Strasser’s Give a Boy a Gun, the main character’s commit horrible acts of violence. In this plot, the reader becomes the protagonist who must evaluate the main character, and it is often the reader who ends up changing as a result. 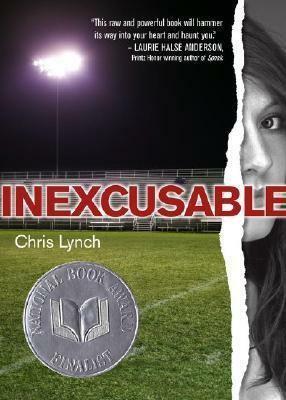 Book Examples: Inexcusable (Lynch), Jumped (Williams-Garcia), Give a Boy a Gun (Strasser). This plot has multiple protagonists in a single location which is “characterized by the interaction of several voices, consciousnesses, or world views, none of which unifies or is superior to the others” (Berg). There can be goals in this plot type, but more often it is a character-driven story in the form of a portrait of a city, group of friends, or community. Film Examples: The Big Chill, Nashville, Beautiful Girls. Book Examples: Keesha’s House (Frost), Give a Boy a Gun (Strasser), Bronx Masquerade (Grimes), Doing It (Burgess). Are you starting to see some of the new and exciting options available? Stay tuned. In part 2, I’ll cover: along for the ride plot, symbolic juxtaposition plot, repeated event plot, and repeated action plot. I want to step back for a second and clarify my own personal definitions of plot versus structure. As mentioned in my previous post on plot definitions there are many views of what plot it! Additionally, I fear that as I walked us through arch plot and classic design last week, I may have reinforced the misconceptions that plot and structure are same thing. Plot and structure are not the same thing! In simple terms, plot is a series of actions with a cause and effect relationship. In my explanation of arch plot, the hero’s journey is the plot. STRUCTURE: Structure is the triangle or mountain shape in the diagram I used. Structure has two parts. The first is arrangement. For example, you tell scene one, then scene two, then scene three. Or you tell scene 3, then scene 1, then scene 27, etc. This is about order and organization. The second part is about patterns, rhythm, and energy. It’s about the movement and feeling your particular arrangement creates. The triangle (often called the Aristotelian story shape) is a visual metaphor for the escalating energy that is meant to come as a result of a classic design arrangement. In the coming posts, I’m going to list alternative plots and alternative structures. I wanted to clarify the difference between these terms so you would better understand how I’ve organized these lists. One is by the nature of the action (plot) while the other is about the organization and rhythm of the action (structure). Bechard, Margaret. “How I Learned to Stop Worrying and Love Plot.” Faculty Lecture. Vermont College of Fine Arts, Montpelier, VT. Jan 2008. Burroway, Janet. 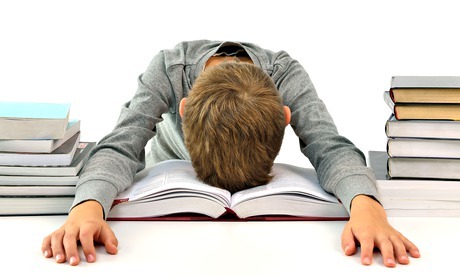 Writing Fiction: A Guide to Narative Craft. 8th Edition. New York: Longman, 2011. Chea, Stephenson. “What’s the Difference Between Plot and Structure.” Associated Content. 16 Feb. 2010. Web. 7 May 2011. Fletcher, Susan. “Structure as Genesis.” Faculty Lecture. Vermont College of Fine Arts, Montpelier, VT. July 2012. With these kinds of endorsements why would you ever consider an alternate story structure? And yet we are constantly encouraged to use this one form of design. In Anatomy of Story, John Truby points out that “one of the great principals of storytelling is that structure doesn’t just carry content; it is content.” And McKee says that: “Our appetite for story is a reflection of [our] … need to grasp the patterns of living … Fiction [is] a vehicle that carries us on our search for reality … story is a metaphor for life … [it] gives life its form.” So, if we seek story as a guide for how to live our lives, and if structure is the content that reveals that guide, then we ought to consider what this one universal story has to say. 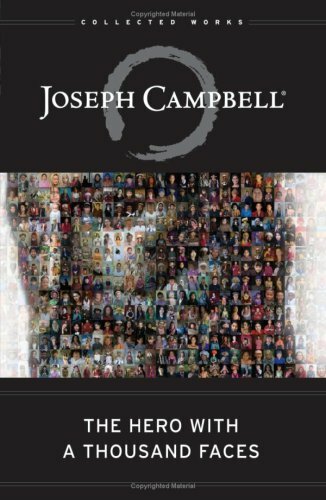 And for Joeseph Campbell (the founder of mythic structure), it turns out he may have had an agenda of empowerment. Bayerl notes that he “became obsessed with the hero’s journey because he was troubled by what he perceived as the despair of his times; he believed that elevating heroic myths would heal the collective psyche. Campbell explains how the hero myth can support healthy psychological growth when people recognize their own problems in the ordeals of the mythic … and are reassured by the stories that give them abundant, time-tested strategies for survival, success, and happiness.” This is exactly what Truby and McKee meant when they said structure can be used as a metaphor for how to live our lives. But what are the psychological implications of this structure? 1) Are Our Lives Defined by Lack of Desire? 2) Does it Create a False Sense of Values? When a plot is goal-oriented and revolves around achieving a task (getting the girl, saving the world, winning the race, etc.) does it create a false sense of values? Instead of searching for wisdom, do we put value in the search for an external goal only to find ourselves disappointed? 3) Does it Limit Our Vision to Only One Aspect of Existence? 4) Is it Socially Coercive? 5) Does it Perpetuate an Untrue American Myth? And lastly, Malcolm Gladwell’s non-fiction book Outliers, has pretty much de-bunked the modern American myth that if you set yourself out a goal, and you try hard enough to overcome the obstacles, you’ll succeed. This simply isn’t true. So why do we continually write stories about hero’s overcoming obstacles and succeeding in the end as if it is the natural order of things? Is it possible that the hero’s journey myth, is just that – a myth. After all, it does initially derive from stories of mythology, and not actual experiences. Not to mention that the popularization of this design is relatively new. Yes, it shows up in ancient works and the classics of western literature. But it’s elevation as the end-all be-all of storytelling started in the 1950’s with Campbell’s research and was greatly escalated by the influence Star Wars on American film. Is it possible that arch plot and mythic structure are the predominant storytelling paradigm of our time and not a universal story? Am I saying that we shouldn’t use this storytelling plot and structure? But I think you should ask yourself why you’re using it, and not use it blindly because there’s an implication that it’s the only type of design that exists. Don’t fret! The coming posts will introduce you to the wide variety of plots and structures that will take you beyond arch plot and mythic structure. Stay tuned and see how many options really are available to you! Alderson, Martha. 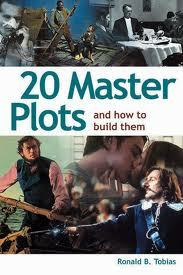 The Plot Whisperer: Secrets of Story Structure Any Writer Can Master. New York: Adams Media, 2011. Bayerl, Katie. “Must We All Be Heroes? Crafting Alternatives to the Hero’s Journey in YA Fiction.” Critical Thesis. Vermont College of Fine Arts, 2009. Bayerl, Katie. “Must We All Be Heroes? Crafting Alternatives to the Hero’s Journey in YA Fiction.” Graduate Lecture. Vermont College of Fine Arts, Montepelier, VT. July 2009. Capetta, Amy Rose. “Can’t Fight This Feeling: Figuring out Catharsis and the Right One for Your Story.” Graduate Lecture. Vermont College of Fine Arts, Montepelier, VT. Jan 2012. Doan, Lisa. 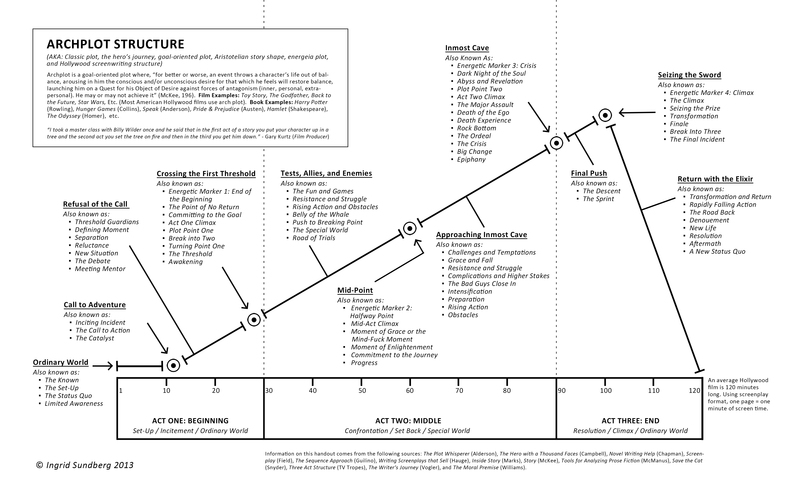 “Plot Structure: The Same Old Story Since Time Began?” Critical Essay. Vermont College of Fine Arts, 2006. Lefer, Diane. “Breaking the Rules of Story Structure.” Words Overflown by Stars. Ed. David Jauss, Cincinnati: Writer’s Digest Books, 2009. 62-69. McKee, Robert. 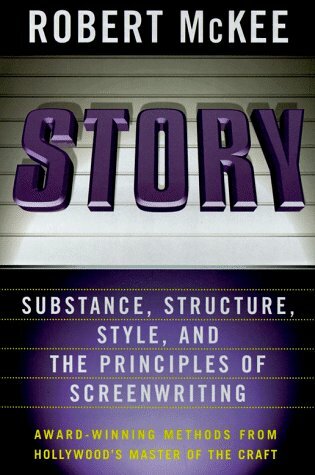 Story: Substance, Structure, Style and the Principles of Screenwriting. New York: IT Books, 1997. Tanaka, Shelley. 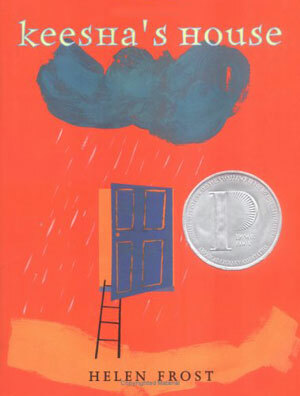 “Books from Away: Considering Children’s Writers from Around the World.” Faculty Lecture. Vermont College of Fine Arts, Montpelier, VT. Jan 2010. Truby, John. The Anatomy of Story: 22 Steps to Becoming a Master Storyteller. New York: Faber and Faber Inc., 2007.